The Memorial to the Murdered Jews of Europe stands on undulating ground, walking distance from the Brandenburg Gate and the old Reich Chancellery. 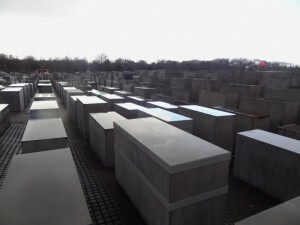 Nearly 3000 concrete slabs of differing height in a grid, under a darkening Berlin sky. They’re not supposed to symbolise anything, but remind me of many things – sarcophagi, gravestones, Arthur C. Clarke’s monolith. As you move around it, parallax makes the entire construct seem to change shape, reshape. At the outskirts, people run past, children play chase. There is laughter and shouting. People sit on the pedestals to wait for a friend, to get close to a lover. Further into the centre, the ground drops away– they turn from stepping stones where young people jump, run, skip, to dangerous platforms bearing a fatal drop. It happens gradually, unnoticed until one slips and falls, or fails to realise it’s too late. The pedestals in the centre are nearly 16 feet high, raising themselves out of the ground. The ground drops away obligingly. At first the rainfall is gradual, people continue to make their way in. Umbrellas offer some protection but need to be held at an angle, to fit through the gaps. As the pedestals get taller, they seem to crowd closer; as the rain increases they get slick, and dark. The rain now a torrent, the wind funnels through the passages – an umbrella, battered, no longer provides protection. You are forced to stand in the lee of a pedestal to get some shelter. Head down, coat pulled tight, everything uncovered becoming soaked. My glasses are dripping and foggy, my vision restricted as I lean against the pedestal, trying to get closer, seeking it’s protection. The noise of the city has disappeared, back there, behind me, a memory. The colour has drained out. Everything has become black and white. We could have gotten out, could have made it back. If we’d just walked in a straight line, determined. The light at the other side seems to be disappearing, the slick darkness approaching. I hear little except the rain. I wait, wait for it to abate, and every so often hear someone. An image flashes past me, as someone runs past leaving an impression of brief, diluted colour and the noise of flapping wet clothing. You hear people calling out for their mother, or lover, or a friend lost somewhere in the dark confusion. But you are alone, you can’t see anyone. Voices disappearing into the distance. Everything we thought was beside us has disappeared, suddenly.